This is the first game in the Deep Dungeon series. 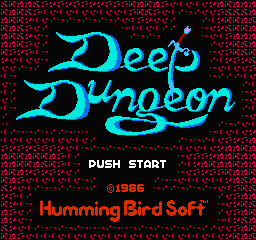 For other games in the series see the Deep Dungeon category. 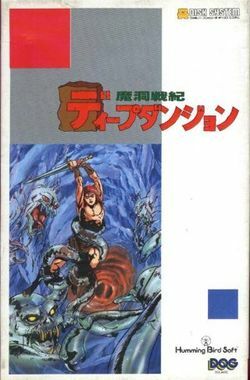 Deep Dungeon: Madou Senki (ディープダンジョン 魔洞戦紀, Deep Dungeon: Madou Senki? lit. Deep Dungeon: The Heretic War) is a dungeon crawler presented in a first person perspective, a style pioneered by the Wizardry series. Players navigate nondescript, maze-like corridors in their bid to find the princess. The Heretic War is set in the town of Dorl. One day, monsters raided the town, stealing both the treasures and Princess Etna's soul. Despite the attempts of brave warriors to retrieve her soul, none have been successful. In the dungeon, the player is given a command list. The player can choose to attack if an enemy is in the vicinity, view allocated items, escape from battle, examine the area for items, and talk if there are people nearby. The character's effectiveness in battle is largely determined by numerical values for attacking power (AP), defensive power (AC), and health (HP). These values are determined by the character's experience level (LEVEL), which raises after the character's accumulated experience (EX) reaches a certain point. The game was developed for the Family Computer Disk System in 1986, as well as the MSX computer system. It was released exclusively in Japan. On April 15, 2006, Deep Dungeon was unofficially translated into English and the patch can be downloaded here. Once upon a time, the land beneath the peaceful town of Dorl became a den of demons. They raided the town, stealing treasure, as well as the soul of Princess Etna. Now all that remains of her is a comatose shell. Many have descended to retrieve her soul, but not even the brave hero Ruu has returned. All that the towns people can do is pray for a hero. This page was last edited on 17 November 2013, at 03:39.